This program makes sure that child care homes are following the state guidelines for child care, making it a healthy and safe environment for children in care. Quality Child Care is a program that helps child care providers become registered, participate in the Quality Rating System (QRS), or increase their QRS rating. First Children’s Finance provides grants and other resources to help child care providers expand or improve their businesses. Mississippi Bend Area Education Agency. 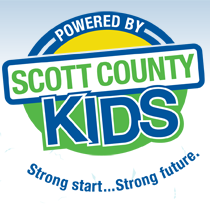 In addition to funding Early Childhood and Decategorization programs, Scott County Kids also helps families find the resources they need to support the mental and emotional health of children from birth to 18 years of age. Dawn Knutson is our Family Advocate and the central point of contact for families and community members serving and caring for children with mental health concerns. This position also provides the community with various trainings, including Adult and Youth Mental Health First Aid. Dawn connects families and providers with mental health resources in the community that meets their needs. She also provides the community with various trainings, including Adult and Youth Mental Health First Aid. Learn more about the Family Advocate role. For more information on youth mental health resources and trainings, visit our Resources page.